Mornings like today's are few and far between. That's probably a good thing because I don't know if I could stand to be any more obsessed and addicted to deer hunting than I already am. A couple more days like today could really do me in. The story behind this deer starts, to a certain degree, with something I learned a couple weeks ago at the Middle Tennessee QDMA Field Day. During a discussion of the importance of native plants for wildlife, Clint and Chris mentioned that ragweed is both high in protein and a favored food of deer. The significance of that didn't really hit me at the time, but luckily, I remembered it last week while I was scouting for spots to hunt during opening weekend of bow season. I was checking an area that has had some good buck activity in the past when I noticed that a small overgrown field was full of ragweed. On the edge of the field, I found a freshly opened scrape about twenty yards away from a white oak that had dropped a few nuts (a rarity this year) and a red oak that had also dropped some of the biggest red oak acorns I've ever seen. Neither tree was what I would consider to be a dominant tree. The nuts that were on the ground appeared to be due to squirrels, not an active acorn drop. It was clear from the churned up ground that deer were feeding there, but there just wasn't enough food on the ground for the sign to accumulate to the degree that normally gets me really excited. Nevertheless, the combination of acorns, browse, thick cover, a fresh scrape, and lots of walk sign got my attention. It definitely had potential and I decided to hunt it when I had a favorable wind. Last night, the weather channel was predicting 46 degrees and a SSW wind for the morning. I checked a topo map and sure enough, the wind was perfect for that spot. I thought about waiting a while to let the acorns start to drop a little heavier but I had a gut feeling and eventually I decided to give it a go. I arrived at the spot about fifteen minutes before legal shooting light and picked out a tree to climb by flashlight. Here is the setup. I had only been settled in for a couple minutes when I heard a "snap" out in the weed field. Something was definitely headed my way but it was too dark to see into the field. I eased up out of my seat, clipped on my release, and fought back that first shot of adrenaline that can develop into a full-blown case of sewing machine knees if you aren't careful. 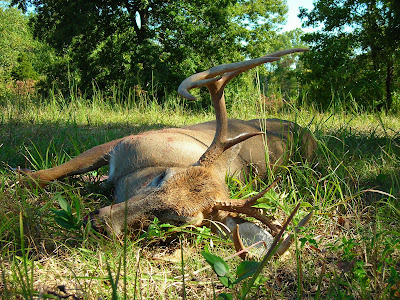 As I scanned the edge of the field, straining my eyes to catch a glimpse of movement, a buck materialized in the scrape and started pawing the ground and chewing on the overhanging dogwood limbs. It was still about twenty minutes before sunrise and the light was just starting to come up. I could tell from the deer's shape that it was a good sized buck, but I couldn't make out any details of its rack. Under other circumstances, I might have waited to get a better look before taking the shot, but with archery gear in the woods, you sometimes don't have the luxury of time. I decided to take the shot if I got a chance. Luckily, the buck turned to the right and started to "do his business" as my mother used to say. That was the opportunity I needed. I put the twenty yard pin behind his right shoulder and concentrated on getting a smooth release and following through like I've done a thousand times in the back yard. 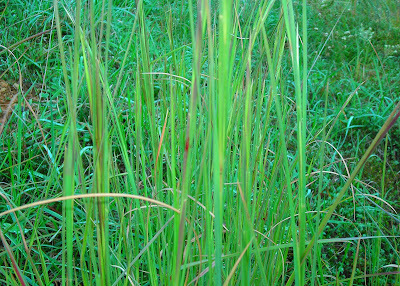 The buck vanished back into the thick darkness of the weed field in an instant. I followed the sound of it crashing off and thought I heard it fall. Or had I? Two other deer had exploded out of the thick cover when the buck bolted, so I really couldn't be sure of what I had heard. I replayed the scene over and over in my head as confidence and doubt battled it out. "The shot felt good." "The impact sounded good." "Did I shoot the right one of the three?" "I think I heard it fall." "What if I hit that little limb that I can see now?" "Was it as good a deer as I thought?" I decided to give it about an hour before I took up the trail. The wait was agonizing so I distracted myself by taking the above photos and texting my son and some buddies. Finally, the time came to get down. 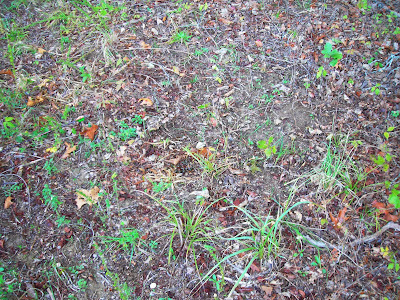 With a mixture of anticipation and dread, I approached the scrape where the buck had been standing when I shot. "Please let me find a bloody arrow where it ought to be." "Yes!" 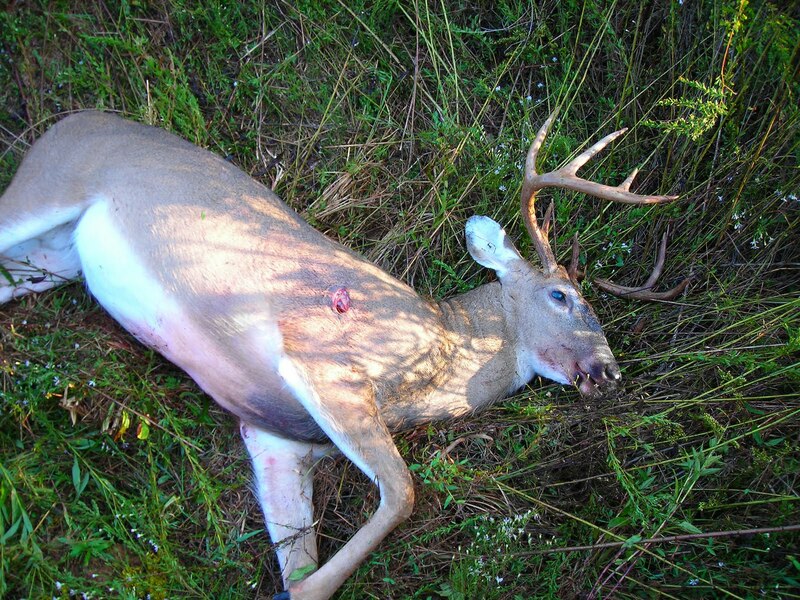 There it was, covered in bright red blood and stuck in the ground about two feet away from the scrape and the buck's last "business." You can click on the picture to enlarge it. The deer had run back into the thick weeds, so I had to track him carefully. 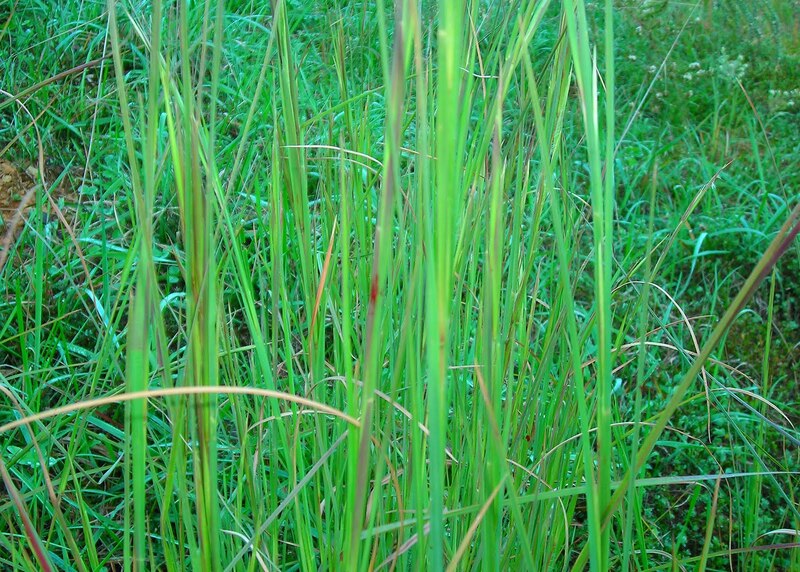 There were very few actual drops of blood on the ground (at least that I could see) but by moving very slowly, I could follow the tiny spatters of blood on the tall blades of grass and weed stems. It took me about twenty minutes to cover the fifty-or-so yards to where the deer lay, but I eventually crested a small rise and spotted him down in the thick stuff. When I checked the deer's stomach contents, I expected to find lots of acorns. Instead, it contained nothing but ragweed and other browse. "Well I'll be," I thought, "you're never too old to learn something new. 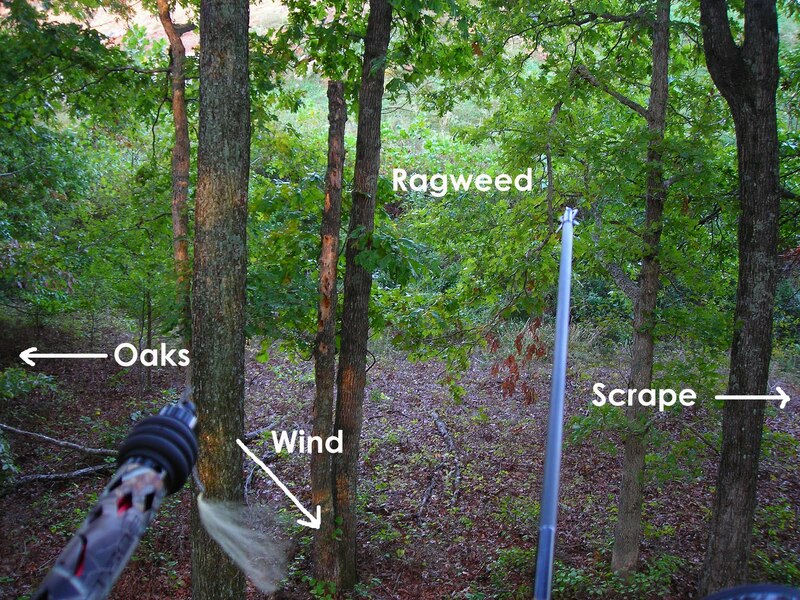 I guess those fellas from the NRCS and TWRA know what they're talking about." As I drove my four wheeler the two miles or so back to my truck, I purposely took my time so that I could savor the moment. The sun was shining and glistening like diamonds off a clear stream beside the trail. The air was cool and smelled of fall. A plan had come together and a nice deer was riding shotgun behind me. I remember thinking, "Man, if you don't love this, you just don't love life." Did you see any ducks????? Nice deer! 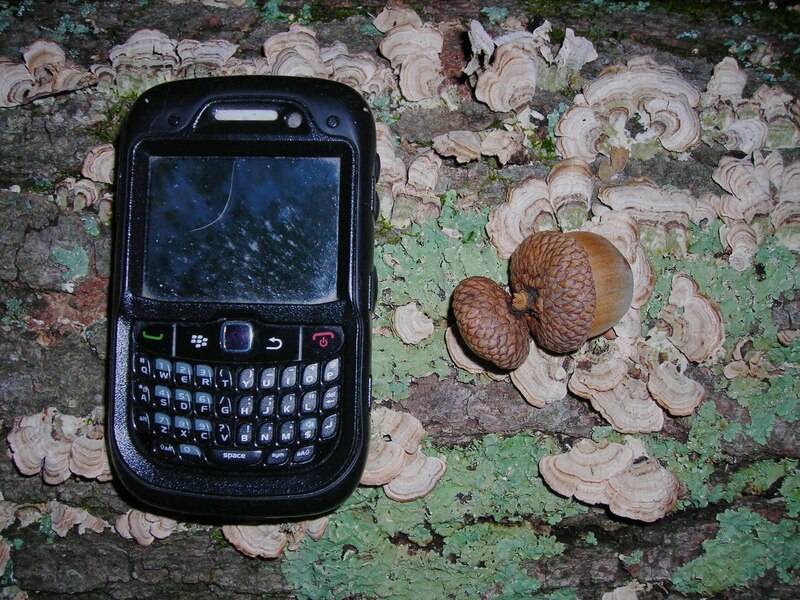 I enjoyed reading your articles on hunting dominant oak trees. I took your advice from the readings and found my first dominant oak. White's are just starting to fall here in NC but for some reason there are more reds on the ground at those are the trees (there's a group of them) where there was sign. Interestingly, I found other caps where deer were eating but no deer poop, but one group of trees where there was poop so I'm going to hunt there tonight. 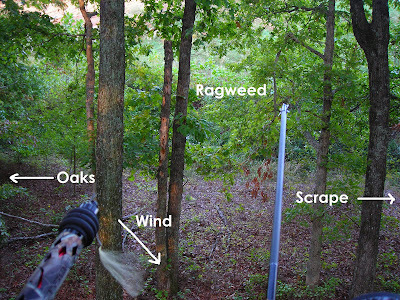 I was wondering how long typically on average would you hunt a dominant oak tree (i.e. 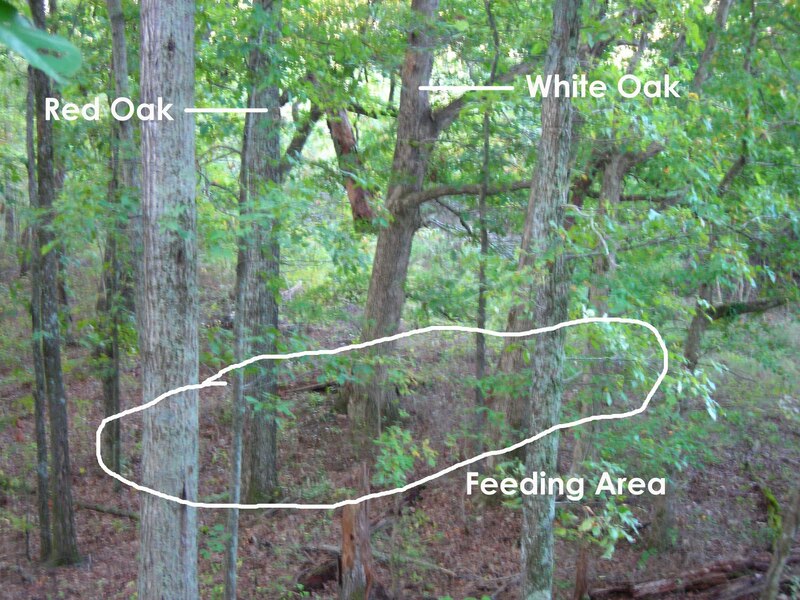 how long will a group of oaks produce that will make it effective to hunt). 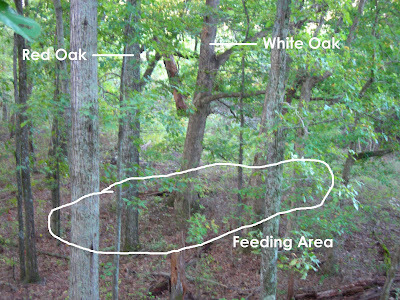 I realize you would stop hunting once the sign is gone, but again, just curious on average how long you hunt one group of oaks. Last question is, how often do you recommend scouting for these dominant oaks. I could see how it might be necessary to scout at least once a week to stay on top of the sign. Thanks and great site! Anonymous #2 - The time a tree remains a dominant tree depends on so many factors, I can't really give you a rule thumb. I've seen deer feed on a particular tree for a couple weeks, but that's not the norm. A few days to a week or so is more likely. Let the sign tell you when they've moved on. The more often you can scout the better. 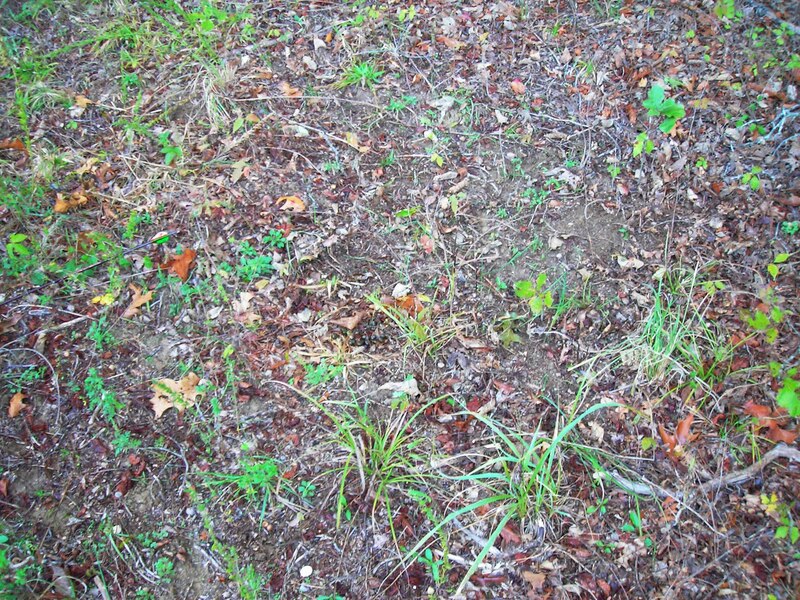 Conditions are constantly changing and so are the deer's patterns. That's what makes it challenging and fun. If you can't scout during the week and are limited to weekends, I'd take my best guess for where to hunt on Saturday morning then spend as much time as it takes after getting out of the stand to find a good spot for Saturday afternoon and Sunday. Thanks Courtney. Yep, I had to change to a drop-away rest insted of a whisker biscuit. I couldn't get it tuned with the WB, but it's shooting good now. Used a two blade Rage. Congrats there you! That is one heck of a buck! Thanks Kari. Good to hear from you. Hope you've been well. I miss your blog.